Yellow Lantana: They bloomed all summer, never needed deadheading and are deer resistant. I married them with annual Blue Salvia, another long bloomer with great color. I had a few Color Guard Yuccas to add to the garden, too. The result, great mixture of colors and textures and a garden that was unapologetically cheery. On a neighboring bird feeder post I let Black-eyed Susan vines take over. They climb and crawl like crazy and offer many flowers. I didn't mind them acting as ground covers, either, for it saved me having to buy more annuals to fill all the open garden space. 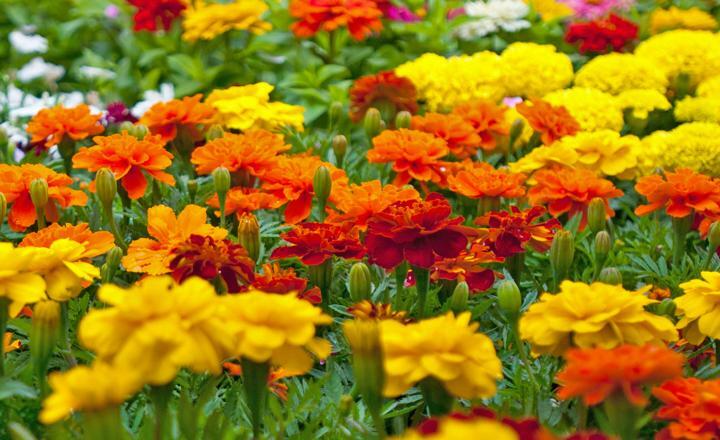 Zinnias are simply a must have. I’m yet to meet anyone, gardener or observer, who dislikes these summer beauties. l indulged in the taller cutting variety and short, bushier plants, too. They both attracted the park goers and butterflies alike. Sure the taller ones had a bit of mildew, but nothing to cause alarm or tarnish the look of the garden. And this last plant surprised me, marigolds. I’m typically not a fan, perhaps I always see these in sparsely planted container gardens or soldiered along a walk, too many inches apart. In this garden I tucked them in on the tight side and they formed a nice cover of yellow and orange blooms. I will admit, they are starting to win me over.